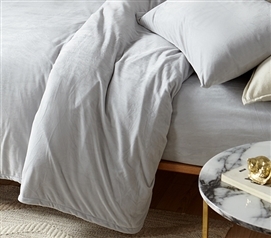 Great dorm room decor starts with great dorm bedding that is also incredibly comfortable. Here at DormCo, we are serious about our college dorm bedding, and offer you the best of everything right down to your dorm sheets. DormCo offers a wide variety of dorm sheets so you can choose the exact color and fabric you want for your dorm bedding. 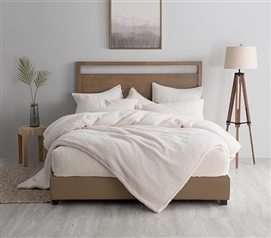 Whether you want to match your Twin XL College Comforter or you want to mix it up with something different, you will definitely find something comfortable that you will love here. From Supersoft Microfiber to Cotton, Plush, and even designer Twin XL Sheets, you will have a great variety of Extra Long Twin Sheets to choose from for your dorm bed. 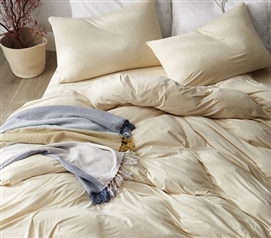 You need a Twin XL Comforter for your college dorm bedding and you will also need Twin XL Sheets due to the size of your university provided mattress. Our dorm sheets also offer extra room for your Twin XL bed toppers and Extra Long Twin Mattress Pads so you can have all of the comfort you want and deserve. While you are taking a look around at our great selection of Extra Long Twin Sheets, keep in mind it is a great idea to have a extra set of XL Twin Sheets handy for when you want fresh sheets or can't do laundry immediately. With our large selection, you are guaranteed to find plenty of Twin XL Sheets that you love!